Staying physically active can boost a senior’s overall health and increase longevity. 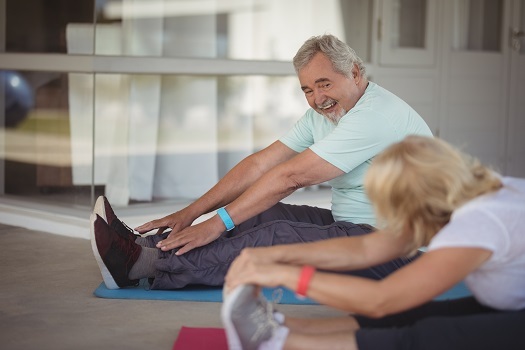 Many adults are inactive during the senior years, and they become susceptible to obesity, memory issues, poor bone strength, cardiovascular disease, and other serious health conditions. However, you can take the following steps to encourage your senior loved one to exercise more often. Exercising in a group may encourage your loved one to continue working out, even when he or she feels like quitting. The group mates can share tips and strategies to use with each technique, simplifying the exercises and enhancing their personal relationships. When seniors exercise with other individuals, they often maintain positive thoughts instead of dreading the workout. Older adults who need help exercising should consider professional in-home care. Sacramento elder care experts are available to provide high-quality care to seniors on an as-needed basis. From assistance with mobility and exercise to providing transportation to the doctor’s office and social events, there are a variety of ways professional caregivers can help your aging loved one continue to live independently. When your loved one completes a fitness goal, reward him or her with a favorite treat, tickets to a local sports game, or gift cards to use at a local store. The thought of receiving gifts and rewards after achieving a goal could motivate your parent to exercise more often. Offering rewards is powerful because the brain latches on to a thought and responds with positive behavior. As a result, the thought of receiving rewards may increase your loved one’s odds of maintaining a consistent exercise routine. Give your loved one an easy routine to complete instead of going into full workout mode. Simplifying the routine may make goals seem more achievable. An example of starting out small is to exercise for 30 minutes twice a week, eventually doing 30-45 minute routines at least four times per week. You can also motivate your parent to exercise by simplifying the activities based on his or her current abilities. Helping older adults with exercise can be a challenging task for overworked caregivers. Families who find it difficult to care for their aging loved ones without assistance can benefit greatly from professional respite care. Sacramento, CA, family caregivers who need a break from their caregiving duties can turn to Home Care Assistance. Using our proprietary Balanced Care Method, our respite caregivers can encourage your loved one to eat well, exercise regularly, get plenty of mental and social stimulation, and focus on other lifestyle factors that promote longevity. Helping your loved one visualize the advantages of exercising can be a motivational strategy. Your parent may think about how a morning walk through the neighborhood allows him or her to see friends while breathing in the fresh air and boosting bone strength. Discussing the positive benefits of exercising may motivate your loved one to exercise more, even if he or she only works out 15-30 minutes every other day. Exercising promotes good physical health, alleviates boredom, and boosts emotional health. Find fun exercise routines your loved one can do, and make sure to change up the routine as often as possible. Include dancing, swimming, bowling, hiking, and other activities. When seniors have fun during their exercise routines, they may look forward to the workout sessions. Engaging in physical activity is not the only way older adults can boost their health. Seniors who want to maintain a high quality of life should consider professional in-home care. If your senior loved one needs hourly or live-in care, Sacramento Home Care Assistance can help. Our caregivers can assist with exercise and mobility, prepare nutritious meals, provide timely medication reminders, and help with a wide array of other important daily tasks. To create a comprehensive in-home care plan for your elderly parent, give us a call at 916.706.0169 today.